One of the great things about gardening, beyond just the whole plant side of things, is the huge variety of fascinating creatures that one finds in the dirt, under pots, and hiding behind leaves. 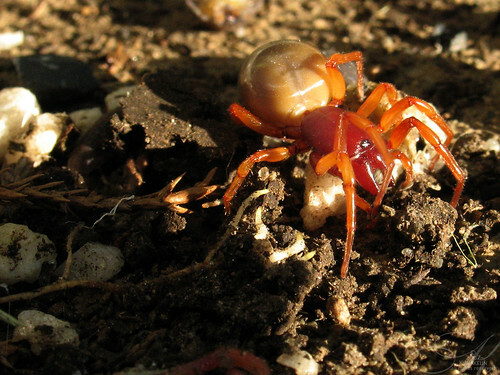 This is a Dysdera crocata, a woodlouse spider that eats sow bugs and pill bugs almost exclusively. It’s got great big jaws to break through hard arthropod exoskeletons. This one was living with a huge population of sow bugs underneath a potted rose – though the spider is probably the more successful of the two species in the ‘living’ department. This is the first one I’ve seen but judging by the number of sow bugs in and around the garden, I’m sure it’s not the only one. From what I’ve read, it’s capable of a pretty good bite, though it’s not aggressive. I didn’t test the theory and kept my gardening gloves on while I moved him into position for the photographs. You should rent your pill bug killing spiders out. Then you can rent out some insect that kills pill bull killing spiders out. Etc. Etc. I predict a rapid growth of this business! Hey missy, you had your own spiders and you vacuumed them up. Can I borrow him/her to deal with the pill bugs that live in my bathroom…?